Basketball is a physically demanding sport and requires more than practicing your game skills to prepare for the season. Whether you play competitively or recreationally, basketball athletes need a combination of speed, quickness, strength, power and body control in order to be successful. Not only do you have to exert high levels of energy, but your body needs to be able to recover quickly to repeat these taxing efforts. Bon Secours In Motion Sports Performance’s team of performance specialists can develop a basketball program that’s right for you, your position and your game. 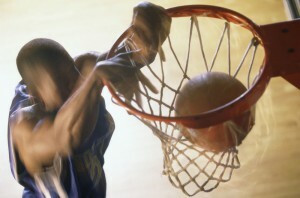 We will evaluate to find your baseline and determine a needs analysis to allow for maximum performance on the court. Our basketball performance program is offered at our locations in Virginia Beach, Hampton, and Chesapeake. Injury Prevention Focusing on Strategies for Preventing the Most Common Basketball Injuries. If you are interested in individual, team or group training, please contact us at (757) IM-SPORT (757-467-7678) for rates and availability.